Nothing says summer like a green mango salad. With its hot, sour, salty sweet explosion of flavours, this salad is the perfect antidote for those sticky, sweltering days of humidity. I made this twice in two days: the second version was a much tastier success, as I made sure to dress the mango shreds at the last possible moment, minimising any sog factor. I brought the leftovers into work the next day, and the shrimp and beans were literally bursting with flavour after soaking overnight in the fish sauce dressing. It also plated very easily too, as you can see. Lots of happy workmates who all pestered me for the exact recipe so they could recreate it at home. Anything goes really, and all ingredients and quantities can be varied according to personal preference. Peel and shred mango into 2 or 3-inch (5-8cm) lengths using a zig zag peeler (from specialty Asian grocery stores), julienne grater or knife. Place into a colander or a bowl lined with paper towel. Finely slice the red onion and place on top of the mango. Set aside. Pound the shrimp using a mortar and pestle. Combine the fish sauce, lime juice and sugar and whisk briskly making sure the sugar dissolves. Pour over the shrimp and add the butter beans, cutting them into short 1cm (1/3-inch) slices. Thinly slice the chilli and add to the dressing. Gently pound the dressing mixture 5-6 times to allow flavours to mingle (taking care not to splash your white t-shirt!). Finely slice mint leaves into slivers and add to dressing. Keep mango and dressing separate until just before eating. Leaving the shrimp and beans overnight in the dressing made them plumper and tastier, I found. To serve, place a mound of mango and onion in the centre of each plate. Top with soaked beans, shrimp and mint. 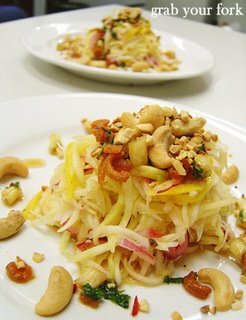 Pour dressing over the mound and scatter with crunchy roasted peanuts or cashews. What is a zig zag peeler? Looks divine!! when you say green mangos that's the sort that you usually find at Cabra right? yummo! sounds and looks delicious! Looks gorgeous! I'm also interested to know where you can buy green mango as I can see myself making this many times! I just found your blog and am so glad that I did! I love mango salad and while we here in Canada are still quite a ways away from summer, this salad makes it seem that summer is just around the corner. Sorry to be so ignorant, but what does one of these julienne peelers look like? Hi Pickles - Thanks, and yep, they're just your standard green mangoes. You could also use green papaya too. Hi Julia - Best places to head are Asian grocers with fruit sections: try Bankstown, Cabramatta, Marrickville or Chinatown (more expensive though). 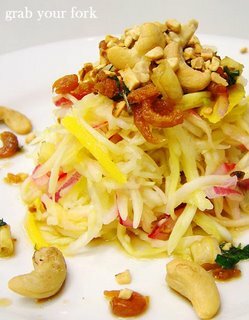 As mentioned, you can also substitute with green papaya. Try the Lucky Thai grocery shop on Campbell Street. Hi Ivonne - You're most welcome! I'm glad you're enjoying the blog. This would make a nice spring lunch too methinks. Hi Cin - That's not a silly question at all! =) Here's a close-up pic of something similar. You can sometimes get these from large department or kitchen stores too. I love mango salads at the local thai places around my area. I was wondering what was your inspiration. Ooh! I live in Campbell St and Lucky Thai is just down the road from me! work? oh yea, you don't really say what you do for a living. Hi Julia - It's a great shop. You might even be able to pick up a julienne peeler too. Hi jismgor - By day I work in an office doing neither. Them's the breaks eh?